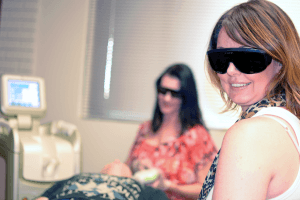 “How does one sum it all up in words when it comes to laser education and professionalism? By saying the name “Krissy Groop”. I was very fortunate to have Krissy as my instructor for laser training at a reputable laser training facility in 2009. Her professionalism kick started me into my own successful laser career and compelled me to be a teacher in my own right. “I am a huge fan of sharing good experiences. I respect knowledgeable people that know their stuff. Kris Groop and staff are excellent educators. I am so pleased with my decision to pursue a career in medical aesthetics. 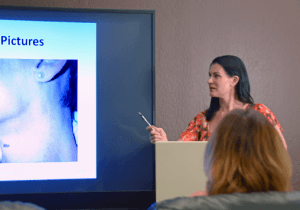 I really feel that I put my career in fast forward when I advanced my education in laser and additional courses such as microneedling and chemical peels at Esthetic Advisor Laser Academy. The course was flexible with my schedule and I didn’t feel like I was just another student in the large herd. They keep the courses very small so that you can receive the one and one attention and direction needed to feel confident. I received hands on education with the freedom to ask any questions that crossed my mind. The didactic portion of the course is just as amazing as the hands on portion of the course. 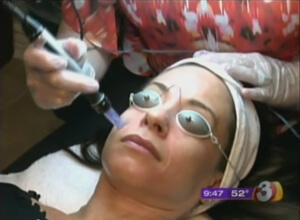 I was intrigued by all the science behind modalities such as laser and microneedling. The classroom setting is super comfortable and clean. They are kind enough to offer snacks, movie theater seating, blankets and whatever you need to focus and learn. I can honestly say I looked forward to my courses every week because it was FUN! I was very bummed out to graduate because I wanted to stay and hang out with the wonderful staff of Kris Groop, Dr. Larry Groop, Tara Steinseifer and Tori Flodin. It’s hard to say goodbye when you are excited to learn and feel supported by mentors.